Removing oil in the process or wastewater stream is critical to maximizing efficiencies within your operation. So, how can you start removing oil? Oil skimmers offer the greatest flexibility when integrating this function into your existing workflow. Choosing the right partner for your application will lead to the most effective installation and a larger ROI. 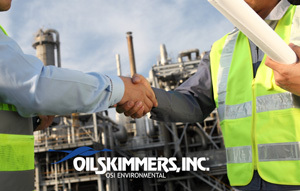 As the first in their field, the Oil Skimmers Inc. team has the experience and continues to set the standard for providing what every customer should expect. Read on for six steps to choose the right partner. Make sure the oil skimmer manufacturer has a long track record of successful and varied installations. The manufacturer should be more than willing and able to provide an on-location survey, and expert counsel based on your specific situation. Ordering equipment from catalogs and over the Internet is hit or miss. You might get lucky, but chances are, you can end up with all kinds of problems compounding the ones you started with. Oil Skimmers, Inc. has thousands of skimmers in use and a team of factory-trained representatives throughout the world. This kind of knowledge base means an answer to your question, or a visit to your site, is just a phone call or email away. Procuring, mounting, installing and testing new equipment seems simple enough. The reality is there are many steps involved in making sure everything goes smoothly. If an off-the-shelf solution does not suit your application, your supplier should be willing and able to make the modifications necessary, including mounting options, material changes, decanting options, weatherproofing/heat options, and more. Look for oil skimmers with built-in durability that can stand up to the harsh conditions of your application, such as those made of cast aluminum with abrasion-resistant ceramics, high-strength stainless steel and bronze parts, and internal gearing. Quality materials and construction mean fewer service calls, less downtime and reduced maintenance costs. Does the manufacturer offer anodization of the skimmer or durable, non-stick coatings like Teflon? Does the manufacturer offer enclosed and sealed units to prevent the release of VOC’s (Volatile Organic Compounds) if they are present? Choose an oil skimmer that commands little attention, monitoring, parts replacements or other maintenance and repairs. With the right skimmer, you should be able to simply turn it on and let it run! Then, you can turn your attention to other aspects of your business as your skimmer continues doing its job day in, day out, for years – and in most instances with Oil Skimmers, Inc. customers, decades. In making an investment in an oil skimmer, be sure your supplier offers a complete performance guarantee. If you are not satisfied with the system’s performance, simply ship it back for a full refund. Oil Skimmers, Inc. has been designing and building quality skimmers for over four decades—and offering performance guarantees for every one of them. When you have the right oil removal solution, it should pay for itself quickly. One area you may notice a return is in extending the life of coolants and wash solutions. The right skimmer will be highly efficient at extracting oil from washing and cooling operations. This extends the life of coolant and wash solutions. Also, you are likely to see lower wastewater treatment costs as your chemical usage goes down and wastewater quality improves. Dies are cleaner, parts are cleaner, and this translates to product quality. Another valuable return can come from recovered oil. Steel mills, food processors and many other customers have been able to add new income streams by selling recovered oil. Mills and parts shops have been able to reuse captured oil within their facilities, as well. In summary, the better your partner, the more you can rely on them to provide an oil skimming solution that is efficient, effective, specific to your unique application, and delivering value. Topics: oil removal, oil skimming, why oil skimmers, inc.